Hello, my name is Steve Lockhart and I run this free forum to provide assistance and my expertise to back pain and sciatica sufferers who are struggling to become pain free. This is not more information about drugs, physiotherapy, chiropractic adjustments or surgery but an effective alternative and natural way to treat your pain - yourself. New posts (questions about how to treat individual pains) are being answered by Steve Lockhart regularly in the Private Members area. Get access now along with your self treatment program via the Ad in the right hand column. Please login below or register an account with Back Pain Forum. 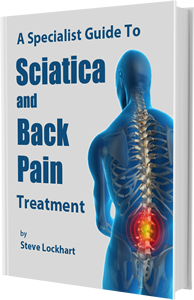 Download a FREE copy of the latest version of my book: A Specialists Guide to Sciatica and Back Pain Treatment.